A: I guess being around it since I was 10 and being in the rink all the time, I’ve kind of always watched it. But I really became interested last season and went to quite a few Stars games. I’m always around the rink and would hear everyone talking about the team, so I got involved and got tickets throughout the 2012-2013 season! 2) Who is your favorite player of all time? A: Mike Modano of course! I’ve never had the pleasure of meeting him, but he seems like a very humble guy and loves the organization he retired under. A: I love doing anything that is a challenge for me. I’ve been an aerialist (silks) for about 3 years now. It’s fun and cool to learn all the tricks as well as have my muscles worked out without noticing while having fun! I also really like to shop. Cause what girl doesn’t? 4)What’s the best thing about being an NHL ice girl? A: The fans. The energy in the arena. The adrenaline we get skating out on the ice. Working hard next to some of my best girlfriends. That’s more than one. But it’s all pretty great. A: No I did not play, but it definitely has crossed my mind a time or two to join a team! 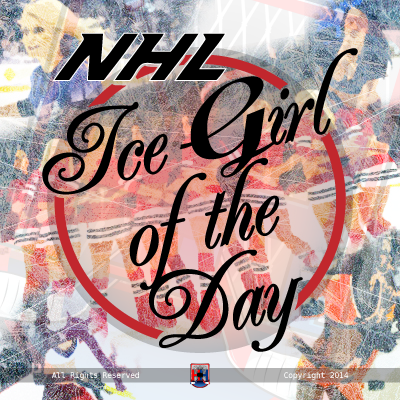 A: I’ve been an ice girl for one season. A: I love how the fans and everyone involved get so pumped about this great game. It’s a energy you just don’t know until you come to a hockey game. A: My dream job would be to model for some clothing companies like Guess, Express, and H&M.